The advocates who spoke to Rewire expressed concern that should SB 4 be instated on September 1, it would only be a matter of time before lawmakers in other states pass similar laws. Protesters gather outside a San Antonio courthouse to demonstrate against SB 4. Read more of our coverage on SB 4 here. Hundreds of Texans rallied at a federal courthouse Monday in San Antonio, as Judge Orlando Garcia heard arguments to block Texas’ anti-immigrant state senate bill from taking effect September 1. Texas Gov. Greg Abbott (R) signed SB 4 during a live Facebook broadcast in May. The law bans so-called sanctuary cities and authorizes Texas police officers to investigate immigration status during routine traffic stops. SB 4 also penalizes law enforcement officials who don’t comply with Immigration and Customs Enforcement (ICE) detainer requests. Lee Gelernt, deputy director of the ACLU’s Immigrants’ Rights Project, argued the first motion representing El Cenizo, one of the many cities and municipalities now suing the State of Texas. Gelernt previously fought President Trump’s Muslim ban. The ACLU in a statement asserted that SB 4 “strips localities and local law enforcement in the state of the authority to determine how to best use their limited resources to ensure the safety of their communities. 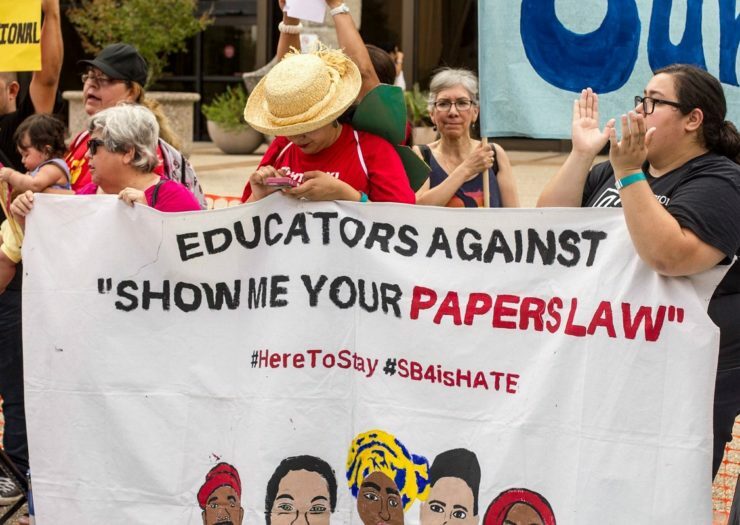 The law, which turns Texas into a “show me your papers” state, is “unprecedented” in the levels of harassment of immigrants and Latino citizens that would result, Gelernt said in the statement. Jose Garza, executive director of the Workers Defense Project, an organization that is also suing Texas over SB 4, spoke to Rewire yesterday at a rally outside of the courthouse. A member-based organization for low-wage workers across the state, Workers Defense has a large membership of construction workers, Garza explained. Undocumented people represent 50 percent of Texas’ construction industry. This was echoed by Amy Fischer, policy director at Refugee and Immigrant Center for Education and Legal Services, a Texas-based organization whose members were present in full force at Monday’s arguments. At the African American Intellectual History Society’s blog, Black Perspectives, Nana Afua Y. Brantuo wrote, “Black immigrants sit at the crossroads of anti-Black racism and xenophobia, subjected to hyper-surveillance and hyper-policing by the state. An atmosphere of highly intensified criminalization contributes to increased incarceration, detention, and deportation.” Brantuo cites the Black Alliance for Just Immigration’s State of Black Immigrants Report, which found that “more than one out of every five non-citizens facing deportation on criminal grounds before the Executive Office for Immigration Review is Black.” The report states that Black immigrants are more likely to be detained for a criminal conviction than the overall immigrant population. Communities that are already heavily policed and racially profiled will suffer more under SB 4, Monica Roberts told Rewire. Roberts is an African-American trans woman and a native of Houston, a city that only recently joined the fight against SB 4, though according to the Pew Research Center, the Houston metro area has the third largest population of undocumented immigrants in the United States. Roberts said that Texas’ SB 4 has “far-reaching” implications for many of the state’s communities. A 2012 study by the National Coalition of Anti-Violence Programs found that transgender people in the United States experience three times as much police violence as cisgender people (individuals who are not transgender), and these numbers are even higher for trans people of color. Even when they are the victims of hate crimes, 48 percent of trans people reported receiving mistreatment from the police when they went for help. This is the focus of Andrea Ritchie’s new book, Invisible No More, which chronicles cases of abuse and violence involving trans women of color, who “often confront types of misconduct not typically associated with the use of force: being groped during stop-and-frisk, forced to perform sexual acts in lieu of arrest, and hit on during domestic-violence calls,” the Atlantic reported earlier this month. Roberts told Rewire she believes SB 4 emerged because of “an increasingly racist Republican Party” emboldened under Trump, and because “[white] Republicans are scared shitless” that they are becoming a minority. But in the state of Texas that milestone was met years ago, she said. The advocates who spoke to Rewire expressed concern that should SB 4 be instated on September 1, it would only be a matter of time before lawmakers in other states pass similar laws. The Trump administration, which has filed a statement of interest in the federal court case over SB 4, seems to support such a move. The Department of Justice argued in its filing that SB 4 is constitutional and is not preempted by federal immigration law. “The administration claims that the 10th Amendment guarantees states the right to craft their own legislation to a certain degree and that SB 4 is valid,” the Texas Tribune reported.